Valley Boy is a 24 year old Thoroughbred gelding, with a chronic history of discomfort associated with his neck and shifting forelimb lameness. Owner has noted resistance to turning, with patient unwilling to bend his neck either left or right, rather tilting his head in order to relieve pressure from reins. Intermittent tripping of the forelimbs, most notably the right forelimb has also been noted. Radiographs have recently been performed by rDVM, depicting reduced spacing between cervical vertebrae, and moderate arthritic changes associated with C3-C4, and C5-C6. 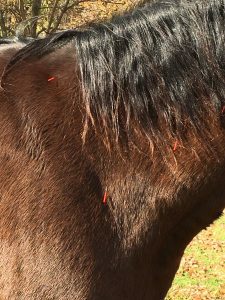 Following 4 acupuncture treatments over a 3 week period Valley Boy showed moderate improvement in range of motion associated with his neck, and significant reduction of stumbling of the forelimbs. Owner had noted resolution of patient tilting his head during pressure change of the bit, as well as improved movement in a circle. Patient presented with a chronic history of discomfort associated with his neck, which had worsened over the last 8-12 months. 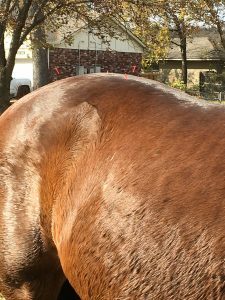 Prior to worsening of clinical signs, owner had elected to perform minimal diagnostics due to patient showing only intermittent discomfort that did not affect ability to perform as a pleasure /weekend riding horse. General lameness exams had been performed previously, with intermittent use of phenylbutazone paste (2.2mg/kg) as needed. Due to recent clinical signs, owner elected cervical radiographs in November 2017. Radiographs depicted moderate arthritic changes of the cervical vertebrae, including; bony proliferation, and irregular joint margins and suspected flare of caudal epiphysis. Not wanting to perform intraarticular injections, or pursue additional invasive treatments, owner elected for additional assessment and treatment with medical acupuncture. – Musculoskeletal: Discomfort associated with manipulation of cervical vertebrae in flexion, extension and lateralization. Significantly reduced mobility of the neck, with lateralization towards the right being most notable. o Grade I/V Lameness of right front when circling to the left. Significant flattening of cervical musculature, with tension and discomfort associated with the Brachiocephalic, Omotransverse, and Trapezius musculature, as well as multiple trigger points appreciated along the Biceps, Teres Major and Triceps of the right forelimb. Moderate tension appreciated along the epaxial musculature, most notably in the thoracolumbar region, likely secondary to compensatory mechanisms to reduce strain on cervical vertebrae. Full assessment of the patient as well as review of patient history indicated therapy focused on treatment of cervical arthritis and secondary/compensatory changes in patient’s musculoskeletal function. Primary focus of therapy was of cervical spinal ne rves, including cranial cervical, midcervical, and cervicothoracic, through stimulation and neuromodulation as well as through manipulation of the musculature associated with head carriage and neck stabilization. These muscles include the Sternocephalic, Brachiocephalic, Omotransversus, Trapezius and Splenius. Additional therapy focused on forelimb lameness, suspected to be secondary to abnormalities associated with the cervical musculoskeletal abnormalities. Vascular malformations, Equine Protozoal Myeloencephalitis, Angioma, Cervical Stenosis (Wobblers), Intervertebral arthritis, Overriding Dorsal Spinous Processes (Kissing Spine), TMJ dysfunction. Putative diagnosis of intervertebral arthritis, with possible overriding dorsal spinous processes of cranial thoracic spine. LI 7, 10, 11, 15, 16, 17, 18. (Needle: Seirin 16×30): Cervical points focused on stimulation of cranial cervical, midcervical, cervicothoracic spinal nerves, and suprascapular nerves. Distal stimulation continued along the Radial nerve to treat for discomfort and musculoskeletal restriction along the forelimb. Treatments performed with dry needling, as well as soft tissue and fascia! manipulation (fascia! release). Cervical vertebrae were also manipulated with repeated methods of neck exercises, including lateralization via stimulation of mechanoreceptors and slight pressure, as well as extension via the “gator method” utilized by Dr. Landes and Dr. Holt. TH 14, 15, 16 (Seirin 16×30): Points utilized to treat for myofascial restriction of shoulder and associated pain, as well as neck pain secondary to arthritis and compensatory use of cervical and thoracic musculature. SI 16. (Seirin l 6×30): Direct stimulation of trigger points/muscular flattening of Splenius muscle. BL 10 11, 13, 27, 30. (Seirin 16 x30, 18×30): Utilized for treatment of cervical pain and tension, secondary to trigger points as well as myofascial compensation secondary to suspected arthritis. Also used to treat trigger points along the Trapezius. Caudal Bladder points used to treat local trigger points associated with sacrum. GB 21 (Seirin l 6×30, 18×30): Point stimulated just cranial to the right scapula for regional trigger points associated with the Trapezius and Subclavius, as well as treatment for thoracic limb discomfort. GV 14 (Seirin l 6×30, 18×30): Utilized for parasympathetic effects in order to reduce patient anxiety. BaiHui (Seirin 16×30, 18×30): Utilized for parasympathetic effects in order to reduce patient anxiety. Valley Boy was treated 4 times over a 3 week period. After initial 3 treatments owner reported that riders have experienced improved turning of the horse under saddle, resolution of abnormal head tilting and fighting of the bit, and improved demeanor under saddle. Serial myofascial exams revealed significant improvement in patient’s cervical mobility, most notably in lateralization. Previously noted flattening of musculature along cervical regions also mildly improved, indicating improved usage and reduction of disuse atrophy. Local stimulation resulted in significant improvement of myofascial mobility as well as reduced inflammation associated with intervertebral arthritis. Utilization of local stimulation triggered a sympathetically induced vasodilation, increasing vascular permeability to allow inflammatory mediators access to the area. With significantly increased nerve endings and dense vasculature within the cervical region, local stimulation has been shown to have great effects (1). These effects appreciated with local stimulation resulted in significant improvement in patients comfort level and ability to mobilize cervical vertebrae. Previous treatments of rest and administration of phenylbutazone provided mild relief to the patient, but no significant improvement bad previously been noted in regards to performance. With addition of acupuncture, Valley Boy has not required administration of anti-inflammatories or additional pain medications. The improved mechanics of the cervical vertebrae also likely indicates reduced stresses and strains on the musculature, leading to improved musculoskeletal health. Most significantly appreciated throughout the patient’s current treatment time is the improved carriage of his head, and general relaxed posture that was not appreciated on initial presentation.